Our kitchen sink became clogged recently so we had to take apart the drain pipes to fix it. 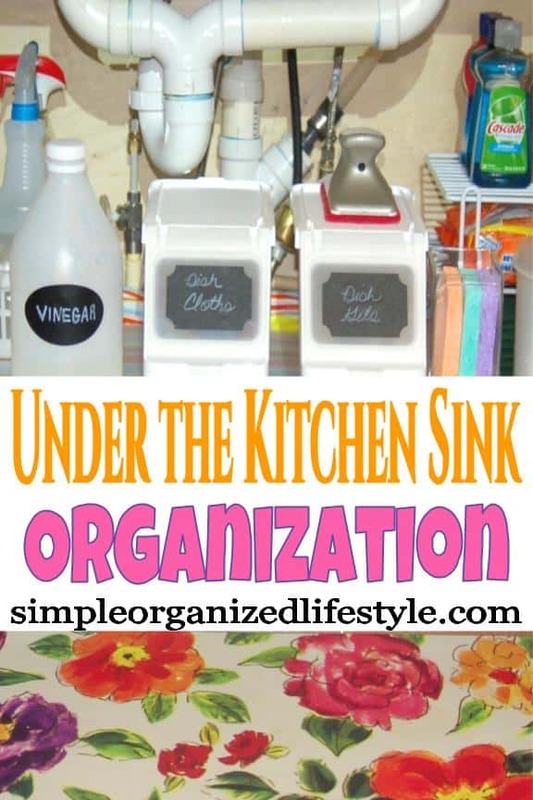 While everything was pulled out, I saw an opportunity to organize under the kitchen sink. Because this project started from an emergency repair, I do not have a [before] picture. It was pretty much a white caddy with some cleaning supplies, a box of trash bags, dish detergent pods, a few vases and an assortment of cleaning cloths. 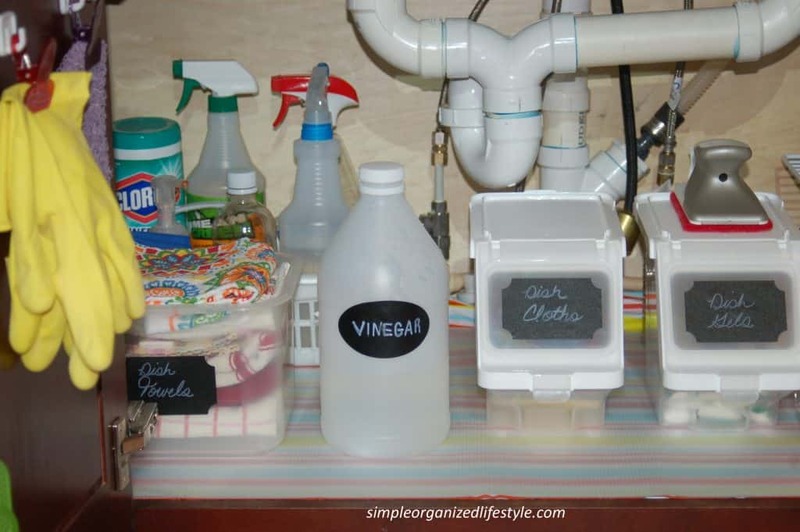 Under the kitchen sink quickly becomes a cluttered catch all spot before you know it. 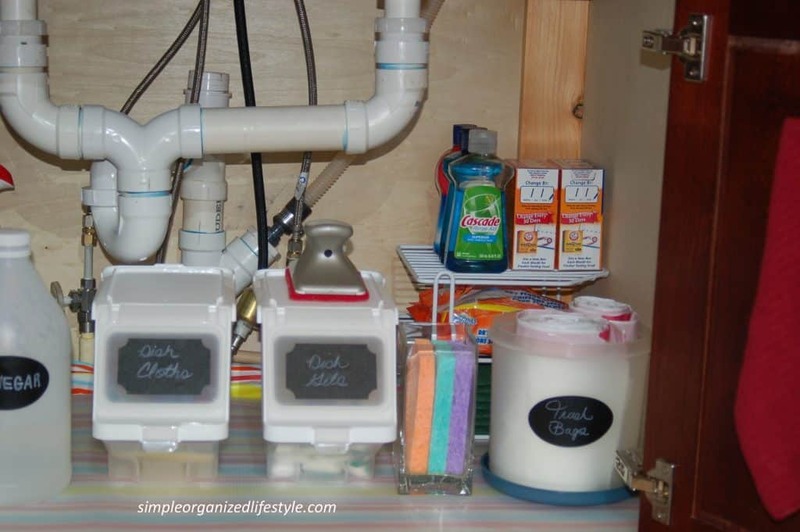 I added two new organizers (the stackable cube storage bins) for dish detergent pods and dish cloths. I moved things around for better storage of frequently used items kept under the kitchen sink. And I’d be honored if you would like to save it to your Pinterest board if you find some ideas here you’d like to try later! I spent $15 improving the space for better storage and organization. It was spent on a plastic table cloth, a roll of clear vinyl and two new storage bins. First, I spread out a cheap ($1) striped plastic table cloth on the bottom of the cabinet. A roll of wrapping paper would have worked too. I had to cut out a rectangular area for those pesky pipes. Next I used a clear vinyl roll ($5) over the table cloth. I like having this in place to manage any cleaning product spills or leaks. After I tossed some expired products and decluttered, I rearranged the space in the order of things we use the most (trash bags, dish detergent pods) in the front to the items used least frequently (extra baking soda, pot scrubbers) in the back. In the back corner under the sink is a white wire shelf that we used to have in the RV. I added that to hold extra baking soda, dishwasher rinse and swiffer refills. Our trash bags are in a round plastic container that we used to use to store coffee before switching to a Keurig. In putting this post together, I realized we can also cut a hole in the lid and use it like a dispenser! I kept one small square vase and repurposed it to hold sponges. The two new cube organizer bins ($8) worked perfect to hold dish detergent pods and dish cloths. (This is the same product on Amazon , but they are much cheaper if you have a Dollar General in your area.) I like having the pods in a container that’s easily wiped clean should one of them bust open and make a mess. 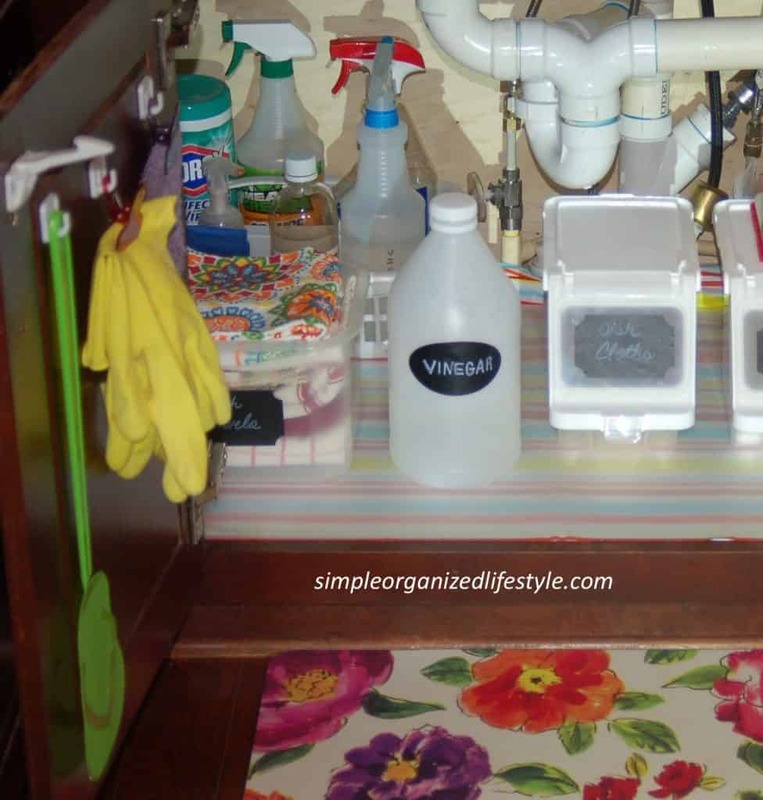 On the left side under the sink is my favorite cleaning product– vinegar, a caddy that holds a few more cleaning products and some dish towels in a storage container. My mother in law keeps a small trash can under her kitchen sink for quick clean-ups. Our trash can is in the center of the kitchen so I don’t really need to use the space for that, but it works out great under her kitchen sink. Once I had everything neatly in place, I labeled the bins with some chalkboard labels. Next up this summer is revamping the kitchen drawers, spices, dishes and pots/pans! Nice post. 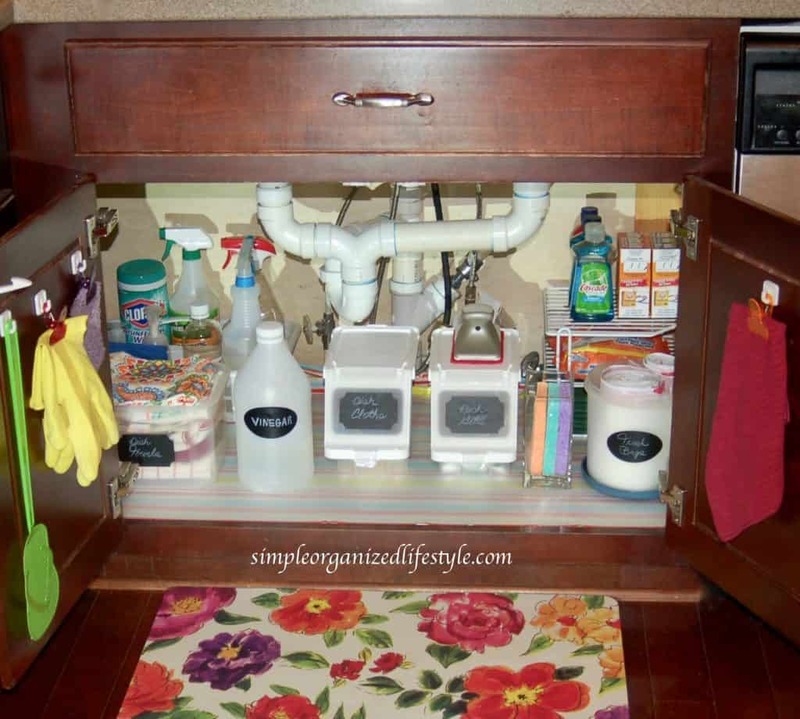 For some reason the space under the sink so easily gets unorganized. There are just so many things that “BELONG” there. Therefore, it takes a very conscious effort to keep it looking nice. 🙂 When it comes to kitchen cupboard or drawer organization I always ask myself: Where would this make the most sense to store” and if the answer isn’t where it currently is then I put it in a pile and find a new place for it. Thanks for always good content. Agree Kristine- where an item makes the most sense is always a good organizing habit… even if it’s not the “typical” place for an item. Glad you found some ideas and thanks for commenting!